The Honolulu Star-Advertiser agrees – Enough already, Maui County! Stop trying to appeal the lawsuit and start fixing the problem! Background: $3 million down the toilet – Enough Already! 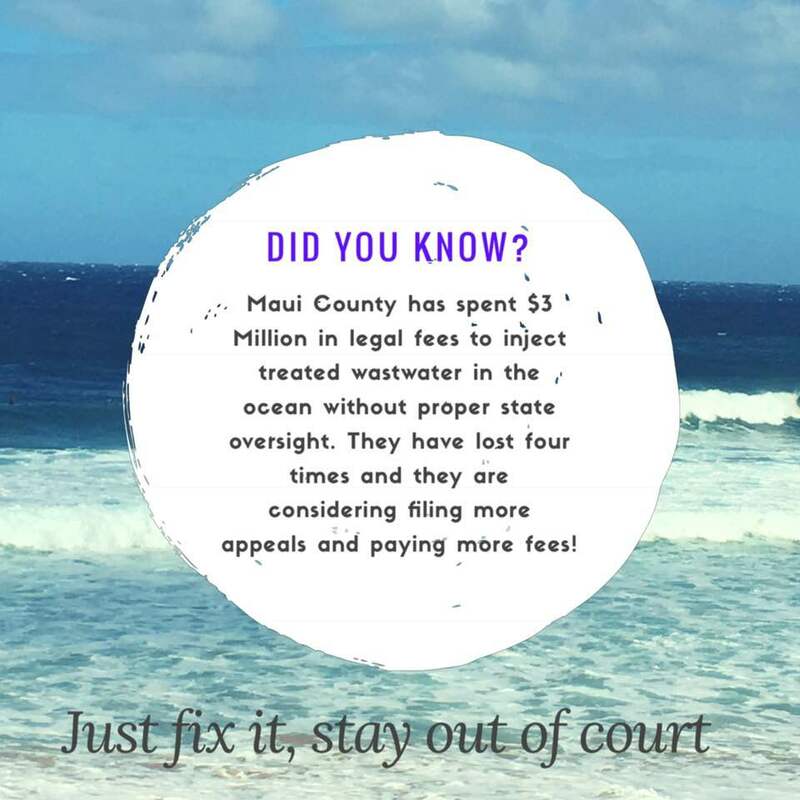 The County paid a main land law firm $3 million to defend its actions of injecting treated wastewater into the ocean without proper state oversight. The County was joined in its fight by the Association of American Railroads, the American Iron and Steel Institute, the American Petroleum Institute, the National Mining Association and the Fertilizer Institute. The County lost the original court case but kept filing appeals – in total they’ve spent $3 million and lost all 4 times in court. Sierra Club Maui Group was one of 4 plaintiffs in the case, and just this month the County lost ANOTHER appeal. The County COULD have used that money to build the infrastructure we need to support water recycling. Instead, now they’re talking about filing MORE appeals. Will this be another $3 million of public money down the toilet? Call or email the mayor and council chair and say: Enough Already – Stop spending the public’s money on lawsuits and just fix the problem! 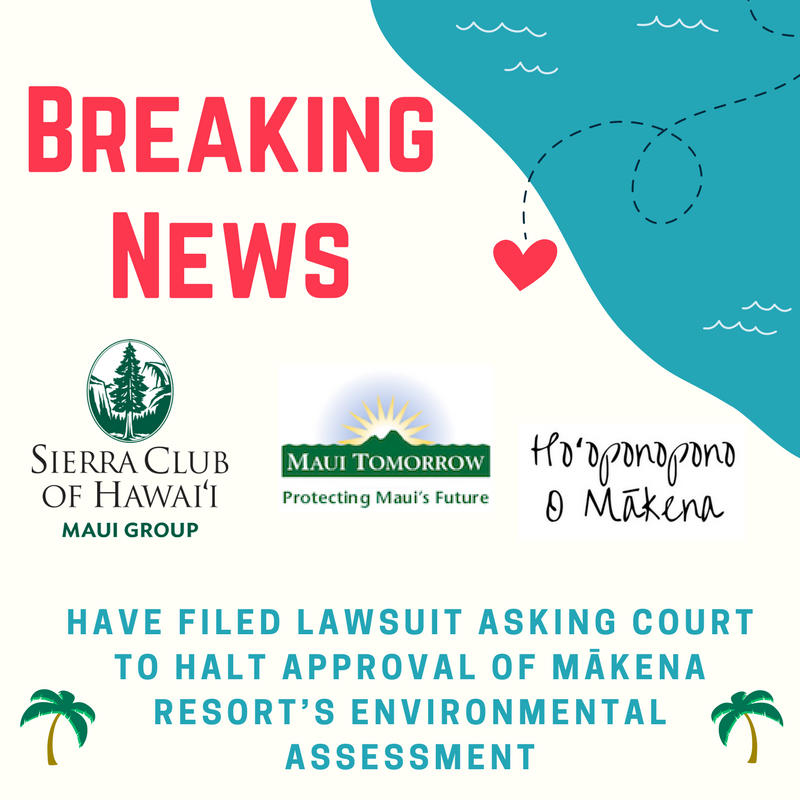 Sierra Club Maui Group, Maui Tomorrow Foundation, and Ho’oponopono O Makena filed a lawsuit on May 2, 2017 asking the Maui Environmental Court to halt the approval of Makena Resort’s Environmental Assessment. We are extremely worried about the environmental and cultural impacts that Makena Resort’s current proposal would have on the area and are doing everything we can to ensure a proper review be completed in the form of an Environmental Impact Statement. Through our lawsuit, we are seeking to invalidate the Maui Planning Commission’s acceptance of the Final Environmental Assessment (FEA) and issuance of a Finding of No Significant Impact for development of the proposed 47-acre M?kena Resort M-5/M-6/S-7/B-2 project, a 158-unit gated luxury community on the mauka side of Makena-Keone’o’io Road, above Makena Landing. The FEA was approved by a 5-3 vote, with several members of the Commission expressing strong reservations regarding unresolved impacts. Read our full press release here. Please support Sierra Club Maui fight the good fight by making a tax-deductible donation to support our legal fees. You can write a check to “Sierra Club Foundation” with “Maui Group” in the memo line and mail it to: P.O. Box 791180, Pa’ia, HI, 96779 or email us to find out how to donate by credit card. We also need non-tax deductible donations that enable Sierra Club Maui Group to do the important political work that keeps Maui?s environment protected. Click here to donate to our general operating fund. Mahalo for your support, and stay tuned for updates! After more than three years of extensive negotiations, environmental and cultural groups, Sierra Club and Maui Unite, have entered into a settlement agreement with developer Honua’ula Partners, LLC and the County of Maui. The settlement calls for the protection of over 160 acres of land containing ancient Hawaiian villages, boundary markers and site complexes, as well as rare and endangered plants and animals. The settlement also includes protection of portions of the historic Kanaio-Kalama Road, specific access rights for cultural practitioners and the public, a reduction in the size of the originally proposed eighteen-hole golf course, a deer fence to protect endangered plants, and a conservation easement over the protected lands to be held by the Hawaiian Islands Land Trust. Another key feature of the agreement is a 116-foot wide buffer along the boundary with Maui Meadows, a one-acre public park located adjacent to the buffer, as well as height limits on certain structures in areas adjacent to the Maui Meadows buffer. Other parts of the agreement call for preserved areas to be turned over to a nonprofit group in the future. The settlement agreement between the parties stems from a claim filed in 2012 that challenged the environmental impact statement that had been prepared by the developer and accepted by the county in conjunction with a proposed 1,400 unit development in Wailea on a 670-acre property near the south end of Pi’ilani Highway. The project, which was initially referred to as “Wailea 670,” was approved by the Maui County Council in 2008 for single family and multi-family units, a range of commercial and other mixed uses, and a golf course. The County Council placed a number of conditions on the development, for the protection of culturally and environmentally sensitive areas – including a “native plant preservation area” of not less than 18 acres and not more than 130 acres. Through their claim, Sierra Club and Maui Unite contended among other things that the developer’s environmental impact statement had failed to adequately address the extent of the cultural and archaeological sites and features located on the property. During the protracted settlement negotiations, the developer agreed to conduct further archaeological work. The archaeologists have confirmed that hundreds of significant archaeological sites or features are located on the property, including ceremonial sites, stepping stone trails, living quarters and farming terraces. Most of these sites are now confirmed for perpetual protection. The claimants also contended in their lawsuit that the EIS failed to address the impacts associated with the 250 affordable housing units that were required to be constructed off-site, at the proposed Kaonoulu Light Industrial Subdivision located on the mauka side of Pi’ilani Highway in North Kihei, which has been the subject of another land use claim. As a result of the settlement, the claimants have agreed that the developer may seek to obtain approval from the County Council to amend the original Wailea 670 project district ordinance to permit the affordable housing to be located either at the Kaonoulu site or at the Honua’ula site, or a combination of both sites. Certain parts of the settlement agreement are contingent upon the developer obtaining additional approvals from the Maui Planning Commission and on the developer actually proceeding forward with the project as originally approved.